Californian singer-songwriter Evan Brown is obviously working with good genes. He’s the son of John F. Brown, a professional musician and songwriter, and indeed, young Evan has been playing professionally since he was twelve. 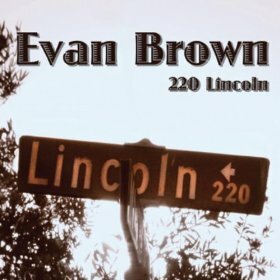 His latest release, the five track “220 Lincoln” EP marks him out as rounded, confident wordsmith, with tunes to match. His soulful, sunshine approach to his music places him in a group of likeminded performers that includes well known names like Jack Johnson and Matt Costa, but listen closely and you’ll hear some intriguing influences at the fore of his sound. The EP begins with “Donde”; a rush of neo-classical Spanish guitar announces its presence, before Brown and the band enter the fray. The original Latin feel of the track remains a constant, though it contends and combines beautifully with a ska rhythm and a muscular electric guitar. I’m not sure I’ve heard anything quite like it before. “What If” is equally persuasive, with a jazzy urgency that will remind some of Rickie Lee Jones, and packs enough hooks for an angling convention. “Dreamin’” slows the pace, “Wed” deploys a chugging reggae beat, and final cut “Today” strips Brown’s sound back to the bare bones, and confirms all suspicions: “220 Lincoln” is a fine collection, and hopefully just a taster of things to come. Review: Affinitia – Do We Go Wrong?